Das Boot! 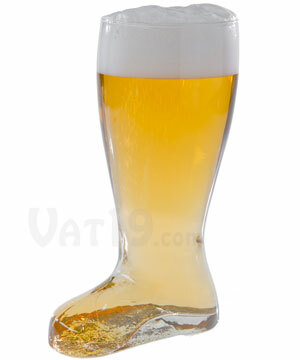 There's just something exhilarating about knocking back a few cold ones from this substantial Glass Beer Boot. Popularized by German soldiers celebrating battle victories, beer boots are the world's most Johann Badarse way to consume a stiff stout. Dimensions: 9.5" x 5.5" x 4"
It's a glass beer boot. And it's straight awesome. There's nothing complicated about this product. It's a glass drinking vessel shaped like a boot. And it makes downing your beer about 13 times more awesome than sipping from a regular pint glass. The Glass Beer Boot holds approximately four beers. In a glass. That looks like a boot. Dear Vat19, what if I don't like beer? 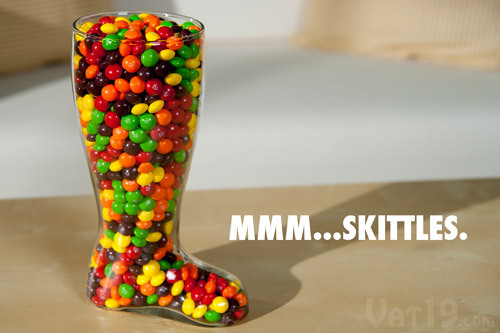 The Glass Candy Boot: Skittles, M&M's, Reese's, Hershey's Kisses, Gummy Bears, or any other delicious candy tastes even better when devoured from the Glass Beer Boot! You can't drink beer ALL the time...right? 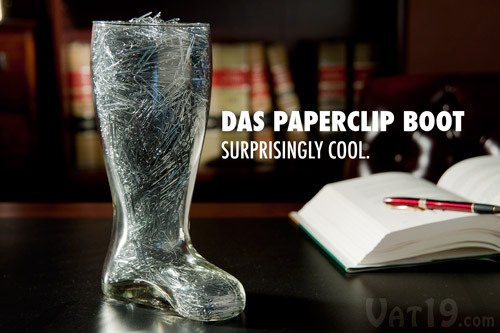 The Glass Paperclip Boot: Seriously, what klassy office doesn't store its paperclips in a glass boot? Probably none. Truth be told, we just thought the picture looked cool. Fun trivia: How many paperclips do you think fit inside the beer boot? If you guessed 2,700, you were right. Paperclips instead of beer? Pure nonsense. Except it does look pretty cool. 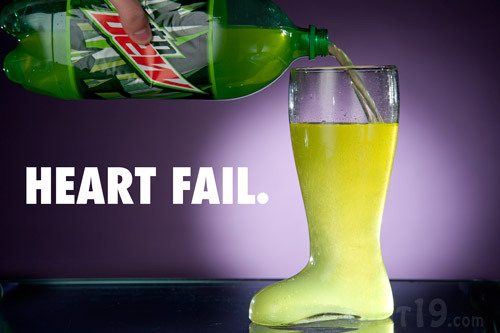 The Glass Heart Failure Boot: Forty ounces of Mountain Dew is the equivalent of about two dozen cups of coffee. Jittery! Drink a Glass Beer Boot full of Mountain Dew and your heart will explode. Literally. 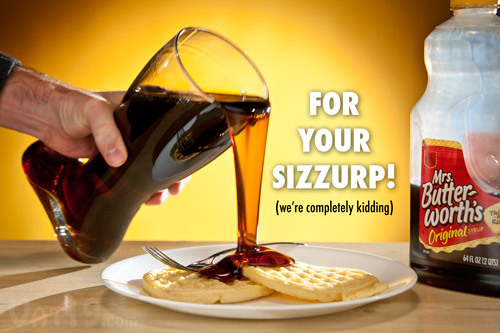 The Glass Syrup Boot: Using the Glass Beer Boot as a dispenser for your high fructose Mrs. Butterworth's is a terrible idea. Seriously. It turns out that the Glass Beer Boot is not a good alternative for a plastic syrup container. There's really no substitute for beer, right? We can try to sugarcoat this (as we did in the previous four photos), but the Glass Das Beer Boot is clearly best utilized as a beer drinking device. 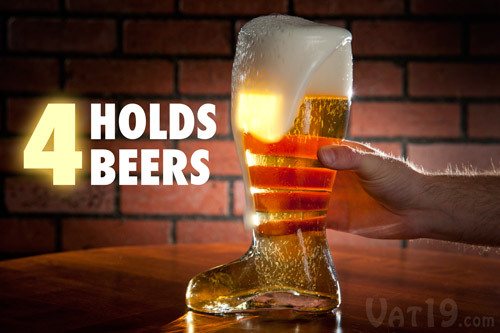 We're certain you'll enjoy knocking back 40 ounces of your favorite brew in this sturdy hand-blown Glass Das Beer Boot. We're confident that even Mickey's will taste better when drunk from the Glass Beer Boot. If you haven't yet seen our music video for Das Beer Boot, please check it out above! For those of you looking for the MP3, the Album Art, and more info about the video, you're at the right place! Yes, you can download the MP3 (just right-click to save)! Yes, he ate the mayo. Yes, he drank the butter. No, do not ever attempt to drink 48 ounces of 5 Hour Energy. No, we didn't allow the entire cake to go to waste. Yes, all of the clothes (and sunglasses) worn in the video can be purchased online...just not from us. Question: Why is this so awesome? Answer: Because we said so. 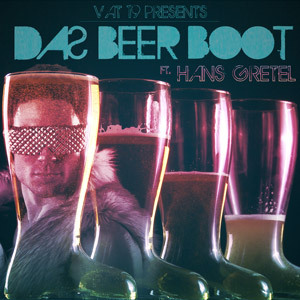 Watch the Das Beer Boot video if you don't believe us. Question: Is it true that Mickey's is simply a blend of Old English 800 and High Life? Question: What does the previous question have to do with the Glass Beer Boot? Answer: No. The Glass Beer Boot is hand wash only. Question: Why do you say that the capacity is between 40 and 48 ounces? Answer: The Glass Beer Boot is made by hand. Therefore, slight variations in the thickness of glass in the arch of the heel can affect the volume of the boot. Question: Is this more awesome than your Giant Beer Glass that holds 5 beers? Answer: That's like asking a parent which child is their favorite. 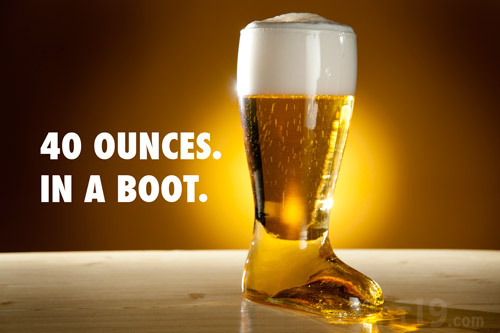 We love the 5-for-1 Giant Beer Glass and the Glass Beer Boot equally. Question: Is there a single reason I shouldn't buy this immediately? Answer: You suffer from pansy-itis? Seriously, you need to own this post-haste.